Schematic drawing of collision between two BECs (the gray blobs) that have been “dressed” by laser light (brown arrows) and an additional magnetic field (green arrow). The fuzzy halo shows where atoms have been scattered. The non-uniform projection of the scattering halo on the graph beneath shows that some of the scattering has been d-wave and g-wave. Scientists at the Joint Quantum Institute (JQI*) have for the first time engineered and detected the presence of high angular momentum collisions between atoms at temperatures close to absolute zero. Previous experiments with ultracold atoms featured essentially head-on collisions. The JQI experiment, by contrast, is able to create more complicated collisions between atoms using only lasers. This innovation may facilitate the creation of exotic quantum states that can be exploited for practical applications like quantum computing. The key to the JQI approach is to alter the atoms’ environment with laser light. They “dress” rubidium atoms by bathing them in a pair of laser beams, which force the atoms to have one of three discrete values of momentum. In the JQI experiment, rubidium atoms comprise a Bose-Einstein condensate (BEC). BECs have been collided before. But the observation of high-angular-momentum scattering at such low energies is new. The new JQI results are being reported in Science magazine online (Science Express) December 8, 2011. ** The paper includes a variety of technical issues which will require some explanation. One of the cardinal principles of quantum science is that matter must be simultaneously thought of as both particles and waves. When the temperature of a gas of atoms is lowered, the wavelike nature of the atom emerges, and the idea of position becomes fuzzier. While an atom at room temperature might spread over a hundredth of a nm, atoms at nano-kelvin temperatures have a typical wavelength of about 100 nm. This is much larger than the range of the force between atoms, only a few nm. Atoms generally collide only when they meet face to face. However, to study certain interesting quantum phenomena, such as searching for Majorana particles---hypothetical particles that might provide a robust means of encoding quantum information---it is desirable to engineer inter-atomic collisions beyond these low-energy, head-on type. That’s what the new JQI experiment does. Scattering experiments date back to the discovery of the atomic nucleus 100 years ago, when Ernest Rutherford shot alpha particles into a foil of gold. Since then other scattering experiments have revealed a wealth of detail about atoms and sub-atomic matter such as the quark substructure of protons. A convenient way of picturing an interaction between two particles is to view their relative approach in terms of angular momentum. Quantized angular momentum usually refers to the motion of an electron inside an atom, but it necessarily pertains also to the scattering of the two particles, which can be thought of as parts of a single quantum object. If the value of the relative angular momentum is zero, then the scattering is designated as “s-wave” scattering. If the pair of colliding particles has one unit of angular momentum, the scattering is called p-wave scattering. Still more higher-order scattering scenarios are referred to by more letters: d-wave, f-wave, g-wave, and so on. This model is referred to as the partial waves view. In high energy scattering, the kind at accelerators, these higher angular-momentum scattering scenarios are important and help to reveal important structure information about the particles. In atomic scattering at low temperatures, the s-wave interactions completely swamp the higher-order scattering modes. For ultralow-temperature s-wave scattering, when two atoms collide, they glance off each other (back to back) at any and all angles equally. This isotropic scattering doesn’t reveal much about the nature of the matter undergoing collision; it’s as if the colliding particles were hard spheres. This has changed now. The JQI experiment is the first to create conditions in which d-wave and g-wave scattering modes in an ultracold experiment could be seen in otherwise long-lived systems. Ian Spielman and his colleagues at the National Institute for Standards and Technology (NIST) chill Rb atoms to nano-kelvin temperatures. The atoms, around half a million of them, have a density about a millionth that of air at room temperature. Radiofrequency radiation places each atom into a superposition of quantum spin states. Then two (optical light) lasers impart momentum (forward-going and backward-going motion) to the atoms. If this were a particle physics experiment, we would say that these BECs-in-motion were quantum beams, beams with energies that came in multiples of the energy kick delivered by the lasers. The NIST “collider” in Gaithersburg, Maryland is very different for the CERN collider in Geneva, Switzerland. In the NIST atom trap the particles have kinetic energies of a hundred pico-electron-volts rather than the trillion-electron-volt energies used at the Large Hadron Collider. At JQI, atoms are installed in their special momentum states, and the collisions begin. 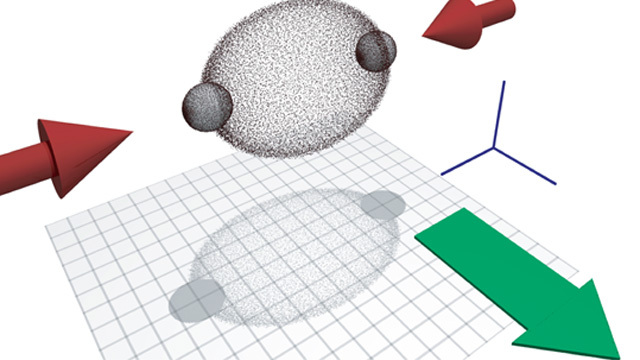 Outward scattered atoms are detected after the BEC clouds are released by the trap. If the atoms hadn’t been dressed, the collisions would have been s-wave in nature and the observed scattered atoms would have been seen uniformly around the scattering zone. The effect of the dressing is to screen the atoms from s-wave scattering in the way analogous to that in some solid materials, where the interaction between two electrons is modified by the presence of trillions of other electrons nearby. In other words, the laser dressing effectively increased the range of the inter-atom force such that higher partial wave scattering was possible, even at the lowest energies. Ultracold atomic physics experiments performed with vapors of atoms are excellent for investigating some of the strongly-interacting quantum phenomena usually considered in the context of condensed matter physics. These subjects include superconductivity, superfluids, the quantum Hall effect, and topological insulators, and some things that haven’t yet been observed, such as the “Majorana” fermions. Several advantages come with studying these phenomena in the controlled environment of ultracold atoms. Scientists can easily manipulate the landscape in which the atoms reside using knobs that adjust laser power and frequency. For example, impurities that can plague real solids can be controlled and even removed, and because (as in this new JQI experiment) the scattering of atoms can now (with the proper “dressing”) reveal higher-partial-wave effects. This is important because the exotic quantum effects mentioned above often manifest themselves under exactly these higher angular-momentum conditions. *The Joint Quantum Institute (JQI) is operated by the University of Maryland and the National Institute of Standards and Technology (NIST).